It’s understandable that a seafood restaurant might want to employ marine life in the naming of its drinks, both virgin and alcoholic, but perhaps it’s time to reconsider having the kiddie and adult versions named after the same sea animal, after parents say a table of kids aged 8 and under were served a round of boozy beverages. 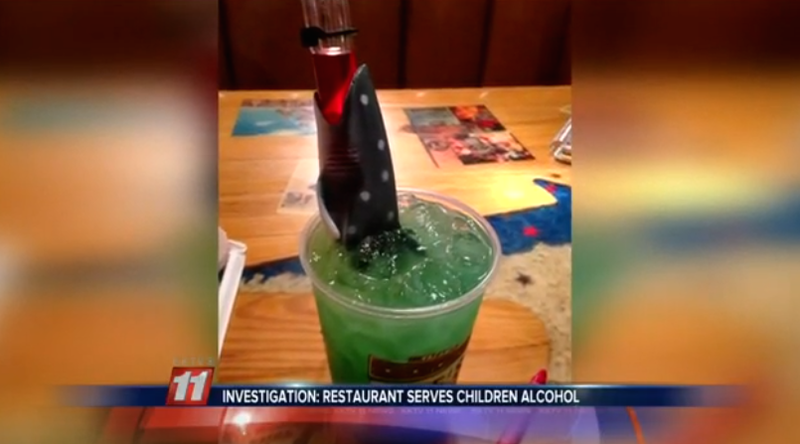 In what might have been a mixup between a drink on the Colorado Joe’s Crab Shack menu for kids called the “Shark Nibble” and an adult beverage called the “Shark Bite,” both of which are blue drinks with grenadine, the group says a waitress told them the youngsters had accidentally been served booze, reports KKTV 11 News. The group says that about 30 minutes after drinks were brought to the table for the kids, a waitress returned to retrieve the beverages, saying they had the wrong ingredients in them. And at that point, the 2-year-old had already finished her entire drink. “You order these drinks, and you order them off the kids menu with the intent that you’re providing your child with something safe and that the restaurant is doing their job,” said the customer. One of the kids complained that she didn’t feel well, so the family called the paramedics just in case. All the kids were checked out and sent home, and their parents now just want to warn others. “I hope that other parents are cognizant of that and take that into consideration when they are ordering these drinks…what is in each and every one of these drinks,” said one. “We do not condone underage service of any kind. Our guests can rest assured that our processes are continuously examined so that incidents like this are avoided,” the corporate office said. Sadly, this definitely isn’t the first time we’ve seen this happen (nor the second, third or fourth time), and it won’t be the last. If you’re worried, you can always try a sip of your kid’s drink first…? Previous Popeyes Or Popeye’s? JCPenney Or J.C. Penney? Do You Know The Proper Names Of These Companies?